The UCP won 63 of the 87 seats of the legislature, provisional results say. Mr Kenney has vowed to do away with a provincial carbon levy and to join four other provinces - including Ontario, Canada's most populous province - in fighting the federal government in court over its carbon tax. The government recently imposed carbon taxes on four of Canada's 10 provinces - Ontario, Saskatchewan, Manitoba and New Brunswick - for failing to introduce their own plans for tackling climate change. 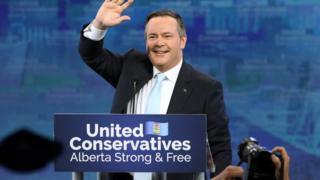 Mr Trudeau offered congratulations to Mr Kenney on Wednesday, saying in a statement that he looks forward to addressing "issues of importance to Albertans and all Canadians" including "taking decisive action on climate change while getting our natural resources to market". The 28-day election campaign in Canada's fourth most populous province centred around its uneasy economic future and its beleaguered energy sector. In his victory speech, the premier-designate promised quick relief for Albertans. "Alberta is open for business," he said. "Albertans have elected a government obsessed with getting Albertans back to work." "For Alberta voters, the election was driven almost entirely by economic concerns; specifically, the province's deep-seated anxiety about its oil and gas industry and the inability to increase the amount of oil it can get to market," said national non-profit pollster Angus Reid. Thousands of jobs were lost following the global oil price crash in 2014-15 - economic doldrums inherited by the NDP, which was seeking a second mandate. There is widespread frustration at the lack of progress on building new oil export pipelines.